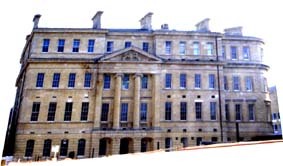 The Royal United Hospital gets its name from the union of the Bath Casualty Hospital founded in 1788 and the Bath City Dispensary and Infirmary founded in 1792. The latter institution developed from the Bath Pauper Scheme, a charity founded in 1747 to provide medical treatment for destitute persons in Bath. The Bath City Dispensary and Infirmary occupied a building in Lower Borough Walls which was constructed around 1730 and which was demolished circa 1860. In the early years it was the residence of Dr Charles Bave, and later became the Alfred Hotel before becoming the City Infirmary and Dispensary. The Casualty Hospital opened in 1788 in response to the alarmingly large number of serious injuries sustained by labourers working on the new Georgian buildings which were being constructed on the east side of the river. The hospital was located at 38 Kingsmead Street which is nowadays a fish and chip shop. In 1824 the two institutions merged and moved into a new hospital building in Beau street, designed by Mr Pinch, a bankrupt builder turned architect. This building featured an operating theatre on the top floor with a tiered observation gallery and was lit by a circular roof light. Further additions to the hospital were constructed in 1865 and were known as the Albert Wing. A chapel was also added. In 1930, the hospital had outgrown its confined city centre site and moved to green fields at Combe Park on the outskirts of the city where it continues to flourish and expand. Its former home in Beau Street was acquired by the Bath Technical College and the building is currently being re-developed as a hotel.